The Duchess of Cambridge has heard the uplifting stories of offenders battling their addictions in a unique unit within a women’s prison. Her Royal Highness sat down and chatted with the female prisoners and ex-offenders during her first trip to a jail – HMP Send near Guildford, Surrey. 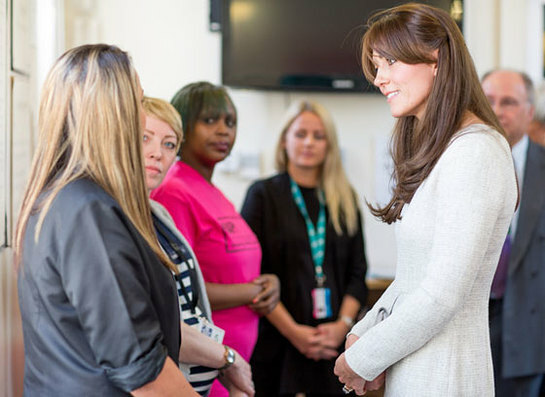 During the visit, The Duchess met women prisoners to hear their personal stories of how they became addicts, and what role addiction played in their offending. A significant focus of the visit was understanding the impact of addiction on the prisoners’ families and the mental illness and other challenges that are often a feature of their pasts. She also heard from ex-prisoners and graduates of the RAPt programme who benefited from the treatment during their time at HMP Send. They spoke about their journey to recovery and how the programme has subsequently helped them live a drug and crime-free life. The visit reflects the Duchess’s interest in learning how organisations support people living with substance misuse issues, and the impact of addiction within the wider family network. Following the visit, The Duchess of Cambridge said: "I was reminded today how addictions lie at the heart of so many social issues and how substance misuse can play such destructive role in vulnerable people’s lives. I saw again today that a failure to intervene early in life to tackle mental health problems and other challenges can have profound consequences for people throughout their lives. The RAPt addiction treatment programme at HMP Send is the only 12-step prison-based drug and alcohol programme for women in the country. It is tailored to support the needs of women with addiction who have often experienced deep trauma and need specialist support to build a positive and crime free life. The programme focusses on building healthy relationships with partners, children and other family members after the often traumatic and damaging impact of addiction and crime. RAPt helps people from the moment they begin a rehabilitation programme in prison, through to leaving prison and building a productive life in the community. That can include meeting someone at the gate on the day of release, helping them to find housing, or supporting them to access training and a job. Half of all prisoners in the UK are estimated to have committed crime associated with drugs (Ministry of Justice, 2013), and alcohol is a factor in nearly half of all violent crime (Office for National Statistics, 2014). According to RAPt, over two thirds of those who have completed the programme are still drug and alcohol free three months after release from prison. RAPt has worked closely with children’s mental health chairty Place2Be, of which The Duchess is Patron. The Duchess is Patron of the charity Action On Addiction and through her involvement with the organisation is aware that substance dependency lies at the heart of many social issues.